On December 9, 2016 at 18:31, an email hit my inbox that was both exciting and intimidating. It was an invite from TEDxTAMU asking if I was interested in applying to speak at their TEDx event in April 2017. I was excited because doing a TEDx talk is a thrilling experience and it has the potential to lead to bigger things; I was intimidated because it’s a lot of work… and it has the potential to lead to bigger things. Technically, a TEDx talk is just another engagement but, if it goes well (and you get a good video (and you say something that resonates (and it gets shared))), it can amplify your message far beyond most other platforms. For example, I’ve done over 500 engagements as a speaker, reaching over 35,000 people live. 10 of those events have shared my talks online, the highest viewcount of any of those videos is 4,883 (a talk on the humor process). The collective viewcount is 19,964 views. My first TEDx talk on humor at work has 211,375 views as of this writing. That’s 13x more people that I’ve possibly been able to help with my message, from one talk. That says nothing of the additional boost in credibility I got from having done a TEDx talk, the quality video I could share to demonstrate my speaking ability, and the joy of knowing 200,000+ people have seen my terrible MS Paint drawings. I was excited, but intimidated. I should note that a TEDx talk is different than a TED talk, and one of my biggest pet peeves is people who claim they are TED speakers when all they’ve done is a TEDx event. The TED Conference is the big one, it only happens once a year, and there’s a pretty intense process just to be able to attend (not to mention tickets cost $5,000). To speak there, you have to be invited by the curators and it’s usually reserved for people doing massively huge things (think Elon Musk and Brene Brown, not “some guy” named Drew). A TEDx event is an independently run event with TED style talks, meaning they’re six to eighteen minutes long. Just about any group can run a TEDx event, assuming they apply and go through the TEDx process. That’s not to say that TEDx events can’t be incredible; the one’s I’ve been a part of have been. But they’re not the same as TED. A speaker claiming to be a TED speaker when they’ve done TEDx is like saying you’re a NFL player because you play football in an intramural league. That said, the process for doing a TEDx talk is similar to a TED event and TEDx events are all roughly the same in setup and format. It starts first with getting an invitation to speak. This might be because someone saw you speak elsewhere and recommended you as a speaker (what happened to me for TEDxTAMU), or you applied online. Most events book 3-5 months before the event date and you can find a list of all upcoming TEDx events on the TED website. Sometimes, as part of this process, you will already know the topic you’re going to speak on. Other times, you’ll build it after you’ve been selected (in a “You’re so awesome we know we want you to be part of the event no matter what you talk about” kind of way). From there, you have a series of check-ins with someone from the event team where you’ll go over your talk leading up to event and make sure you don’t just try to wing it like 90% of the other things you do in your life. The day before the event you’ll do a rehearsal of your talk, getting last minute notes from event staff or sometimes a presentation coach, as well as get used to the stage, clicker, etc. The day of the event, you’ll do the talk as part of a line-up of other awesome speakers, and maybe do some networking as well. After the event is over, usually one to three months, the video will go onto the TEDx YouTube channel to be shared with the world. A very select few TEDx videos are then upgraded to the TED website (like Shawn Achor). How these upgraded videos are selected, I do not know. I’ve been told that a member of the TED curation team watches every TEDx talk and so it’s possible that they decide, or they sometimes add a talk if it’s been viewed millions of times on YouTube. Either way, I’m told it’s not something you should expect to happen, like winning the lottery or successfully solving one of those peg board games on the first try. After that, you are a TEDx speaker and can share the video with anyone willing to watch. How to take risks with no fear. Three steps to small talk. We are not our personality assessments. The Perils of Unleadership. A talk exploring the difference between intention and action, and the things we unknowingly do that demotivate the people around us. The Quantification of Life. A talk focused on the pros and cons of quantifying everything we do, complete with examples of things I’ve tracked and analyzed over the years, including: tracking every hour of my day for an entire year, using data analytics to determine my favorite song, and my stand-up on attempting to quantify love. The Skill of Humor. A talk on the idea that humor is a skill, which means it can be learned. I saw this as an extension of my first TEDx talk on humor in the workplace with more of a focus on how to be funny instead of why to be funny. What do you have the most expertise in? TEDx isn’t just about sharing an idea you think about, it’s about sharing something you are truly a subject matter expert in and can bring new perspective to. They want to hear about the challenges of the modern school system from experts like Ken Robinson, not your Aunt Karen. What can you execute really really well? Because of the potential a TEDx video has, it’s important to do something you can knock out of the park. Trying something out for the very first time is great for an improv stage, not the TEDx stage. What do you want to speak on going forward? Assuming the talk goes well and you get great video as a result, you’ll start to get inquiries about speaking on the topic of your TEDx talk. Unlike stand-up, where a video of your material usually indicates that material is nearing the end of its lifecycle, a TEDx video can be the start of you talking about that topic for years to come. 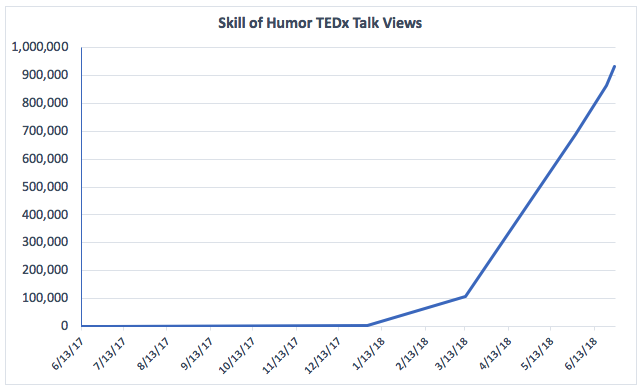 Based on this criteria, I applied to TEDxTAMU to speak on The Skill of Humor and was accepted. NOTE: If you’re organizing a TEDx event and think any of the other ideas sound interesting, I’d be happy to share it at your event. I’d also add talking about the lessons from my new book, The United States of Laughter, to the mix. Have your people email my people. As mentioned, there’s a typical process that all TEDx speakers go through for an event, and one of the most helpful parts of the process is having a deadline. Unlike Tim Urban, I don’t procrastinate; I just believe in Just-In-Time Productivity. So the deadlines served as great motivators to actually work on my talk. However, that wasn’t enough. So I did what I do whenever I’m preparing for a new talk: I booked myself on stand-up shows. All of my talks include a lot of humor (even if I’m talking leadership or decision-making) and no matter the venue, I am always corporate clean. My material is Rated Mom (as in I always want my mom to be comfortable watching my work). Therefore, if material I do works in a stand-up comedy club, I know it’ll work with a speaking audience because the bar for laughter is lower. It gives me deadlines. If I book five shows in a week, that’s five times I’ll be thinking about, writing, performing, and reviewing the material I’m working on. Sure, I could theoretically still do that if I didn’t have any stand-up shows, or I could also just catch up on Doctor Who instead. In the four months leading up to the TEDx event, I did 17 comedy shows to work on material that could be used in the talk. As it got closer to the event, however, I knew I couldn’t just do stand-up as I needed to work on transitions and do full run-throughs. So I started finding ways to work on the complete 18 minute version of the talk in front of more traditional speaking audiences. First, I re-arranged my humor keynote so that I could do The Skill of Humor as the middle section of my talk. Second, I reached out to a few previous clients, as well as a couple of meetup groups, and offered to give my talk for free. To them, they got a good talk for no cost, for me I got a deadline on my calendar to practice the talk and get feedback. In total, I was able to practice my full TEDx talk 13 times in front of an actual audience before the event. Going into the final week before the event, I felt pretty good about the talk. I knew the jokes were funny because I worked on them in stand-up; I knew the TEDxTAMU team was happy with the talk because of our check-ins; and I knew that the overall flow worked as a speech because I had tried it in front of real audiences. And then, three days before the event, I presented a modified version of the talk to my brother’s class at Texas A&M. My brother, David Tarvin, is a communications lecturer and has a PhD in rhetoric. He teaches public speaking, leadership and conflict resolution, and intercultural communication; needless to say, he knows a thing or two about speeches (but only a thing or two, I refuse to give him too much credit). Side Note: People often wonder what it is about our upbringing that led me to being a professional speaker and my brother being a teacher of public speaking. The truth is that it’s mostly coincidence. I got into being an engineer and doing stand-up and improv; David got into it because he loves teaching and likes to talk. After presenting it to his class, with positive feedback all around, I asked David for feedback. His response was, “It’s good.” (Long Pause) “But…” and then he basically outlined how, in an 18-minute talk, I had two primary themes when any good talk, particularly one so short, should have only one. We parsed through the speech and I realized he was right. I definitely had elements of The Skill of Humor as a theme. However, I also had a theme for why to use humor at work, the topic of my first TEDx talk. As it currently stood, this TEDx talk was almost like an updated version of my first TEDx talk with different jokes. And that’s not what I wanted. I wanted this talk to complement the first one. The entire goal of the first talk was to convince people why humor is so important. The goal of the second talk was supposed to be how to actually use humor, no matter how funny you think you are. I shared my changes with David on Thursday night, he approved, and then I presented it to another one of his classes on Friday. The feedback was even better than the previous deliveries and I knew the new structure was definitely stronger. Friday night, I did the dress rehearsal and got positive feedback from the TEDxTAMU team. Then I had dinner with family (my mom had come down for the event), and went to bed, dreaming of a successful event (and milkshakes). Having done over 500 speaking events in my career, I don’t often get nervous before events. Usually I just get excited. Saturday, April 22nd was different. I felt the nervous energy that is a mix of fear and excitement, the same nervousness I felt when I first started doing improv 10+ years prior or whenever I get onto an empty subway car in NYC (is it just my lucky day or is the car empty because of some horrid smell?). I woke up at 8:50 and did a run-through of my talk. My only real concern at that point was time. Whenever I practiced the new version on my own, I came in at around 22 minutes. Not good for a 18-minute talk. My last run through of the morning came in at 20 minutes and I figured that was close enough, given that I typically talk faster in the moment and I wouldn’t have the luxury of pausing to collect my thoughts. I showered and had breakfast before David, my mom, and David’s roommate, Andrea, dropped me off at the event. I went backstage and met some of the other fellow speakers while my family found their seats (front and center). I was the last speaker in the second block of the day. That meant I got to sit with my nerves a little while longer while my fellow speakers went out and did their thing. I remember they had a great mix of compelling ideas and fun delivery but I honestly couldn’t tell you what they talked about. I was too focused on my own fate. And then it was my turn. I hit the stage at approximately 11:35 CT and, as I walked to center stage, my nerves dissipated. Before I knew it, I was excitedly sharing the first story about my grandmother texting me. And after 19 minutes and 16 seconds, I walked off to applause. 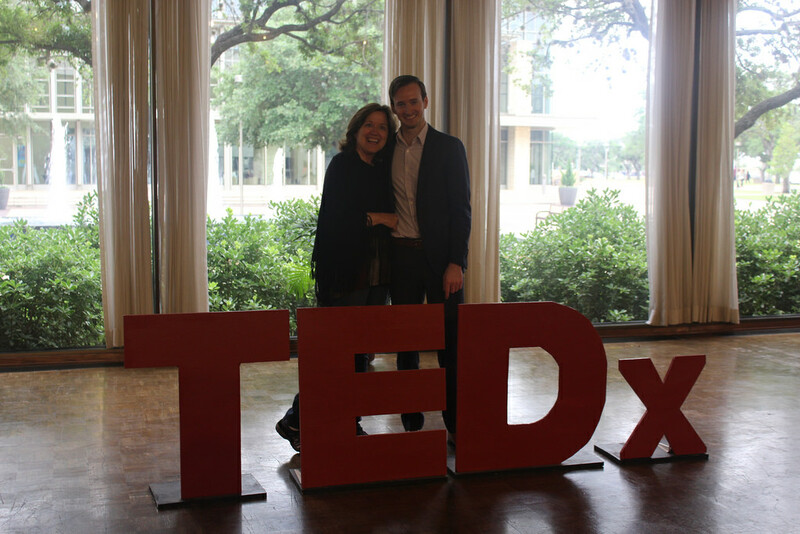 Afterwards, I took some pictures with the TEDxTAMU sign, with my mom, some of the team, and a few new fans I had gained during the talk. Then we headed to lunch as a family and I finally breathed a sigh of relief. Giving a TEDx talk is only part of the journey. After that, you wait for the video. The video is edited by whatever group the TEDx event has contracted, and then uploaded to the TEDx YouTube channel for the world to see. For me, there was an intermediate step that was supposed to happen, didn’t, but then eventually did. From my first TEDx talk, I realized how important the edit of the video is, particularly with a talk on humor. With TEDxOSU, I saw an early draft of the video and had a few notes to share (73 of them, actually). They included things like, “When I compare myself to ‘skinny Hugh Jackman,’ cut to a close up of my face so that you can see that I do, in fact, look like a ‘skinny Hugh Jackman. '” Things that helped the comedy flow and punchlines work in a video setting. So, when I agreed to do TEDxTAMU, I confirmed that I would have the ability to give notes on the edit before it went live. This got lost somewhere in the process, so when I sent a follow-up email to see when I’d get to look at the rough-cut, I was informed the video was already online (with 800+ views). Unfortunately there were a few key problems with the initial edit, so we had to pull the video and do a re-edit. After a couple of iterations, I was happy with the video and they re-uploaded it to YouTube and everything was great. Almost. The default thumbnail for the video was one of my slides and didn’t really represent what my talk was about. I sent an email to the TEDx YouTube channel (with the support of TEDxTAMU), and they changed the thumbnail to something more engaging. And then everything was great. My talk has now been online just over a year, and as of this writing, has been viewed nearly one million times. But the success of this talk (views-wise) is relatively recent. Views haven’t been the only positive from the experience. 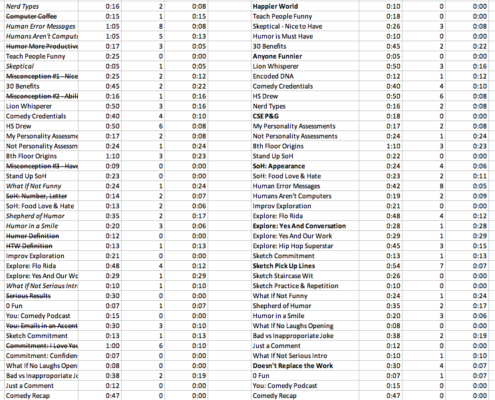 In addition to the fun of having a lot of hits, I can also point to the TEDx talk as a direct source of income. I’ve had nine inquiries come in that have specifically said they first saw my talk; four of those inquiries have led to bookings. In other cases, I’ve used the talk as proof of credibility and as a speaker demo when people have asked about my services. I’ve also gotten a few podcast invites and one inquiry to see if I was single. But the most powerful outcome has been the comments I’ve received from people about how it has impacted their life. People from all over the world have reached out on YouTube, Facebook, LinkedIn, Twitter, and Instagram to share what the talk has meant to them. But you can’t please everyone. As of this writing, the video has 19,000+ likes and 465 dislikes on YouTube. And some of the comments are less than positive (including one YouTuber who claims I am “Formulaic, dispassionate and utterly predictable”). Still, it seems to have made a good number of people laugh, and hopefully learn, and that’s all I can ask for. Note: We’ll ignore that it’s taken me six months to actually publish this post. For the talk itself, I’m happy with my performance in the video. There were a few spots where I stumbled but none of them are catastrophic and I don’t think they detract from the performance. A big shout out to the TEDxTAMU team for having me at the their event. And to other TEDx organizers, seriously, email me! I’d love to do another talk (maybe even a talk on a giving a talk?). 2017 built on the good and bad of 2016. Political discussion got more divided, the weather got harsher, and my personal year was great. 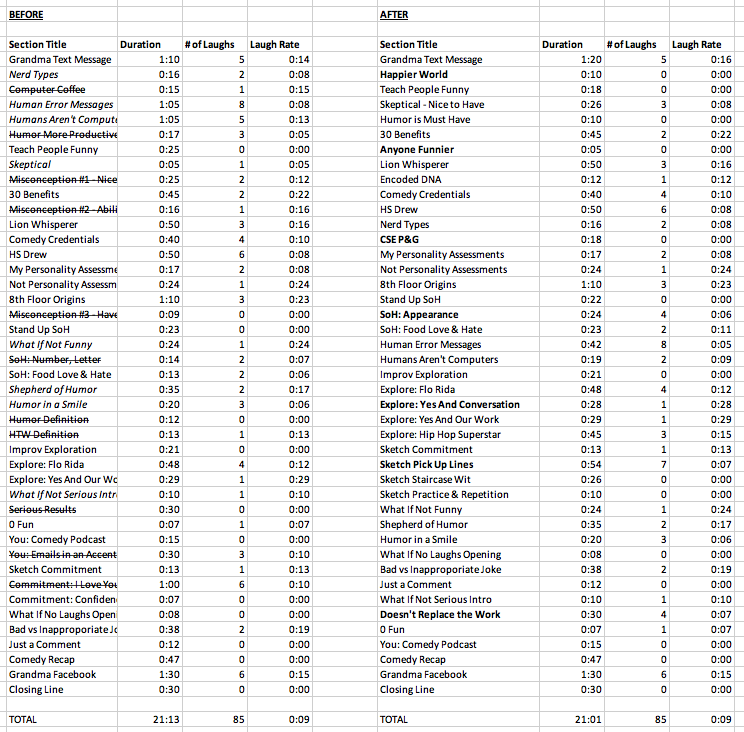 So, ignoring the macro and focusing on the DrewCo, here’s my review of 2017. After much hemming and hawing, I finally decided to actually write a book about my experiences as a nomad. When I began, I wasn’t entirely sure I would publish it, maybe just keep it as a more in-depth journal of my journey. But after the first few drafts, and getting inspired by Bill Bryson’s A Walk in the Woods, I decided to unleash it upon the world. I’m very glad I did. As a result, I hit top new release in both Travel Writing and Humor Essays, I launched the book out of a catapult, I talked about it on a few different news stations, and 50+ people gave it a 5-star review on Amazon. Runner-Up: My second public TEDx Talk. As many of you know, I love sugar. It’s my biggest vice, far greater than any alcohol or Grand Theft Auto video games. For 2017, I made it a goal to consume less than 100g of sugar each day which meant dropping my usual breakfast (Pop Tarts), no longer pretending drinking juice was particularly healthy, and limiting myself to only one dessert a day. Yes, this was actually a challenge but definitely needed considering 100 grams is double the old recommended amount by the World Health Organization and four times the updated recommendation of sugar for an adult (25g or less than one soda). Runner-Up: Read a book a month. There are a few conferences I try to attend every year and the National Speaker’s Association annual summer conference is one of them. Though I’ve attended in the past, this year helped me establish additional credibility as a humorist and helped me further build my network with some of the most talented, and giving, speakers I’ve ever met. Subsequent meetings and events that sprang from those relationships have already started to transform my business. My brothers and I don’t always get a chance to hang out considering we live in three different states, but it’s always a great time when we do. This year, for Adam’s Bachelor Party, we surprised him with a trip to Texas for a couple of baseball games, great food, and general brotherly fun. It was another busy year of speaking but nothing can top the 18 minute talk I did for TEDxTAMU. I got a chance to talk about my favorite subject (humor), one of my brothers and my mom were in attendance, and it went very well. The fact that I have a great video as a result of it is an added bonus. Nate was the reason I got into comedy in the first place but we don’t often get a chance to perform together considering we live on opposite coasts. So, when presented with the chance to be the monologist for his Armando show, it was a no-brainer. My trip to Acadia National Park could not have been more perfect considering the views, hiking, and the company. It’s hard to still be impressed by pizza, but Di Fara’s in Brooklyn manages to do it. All of the pies are still made by the original owner and they are exquisite. I’m not usually a horror film fan, but Jordan Peele’s movie does everything so well it’s hard not to like. It feels like there isn’t a wasted scene or line in the entire thing. I was late to the game with Stranger Things but it was thoroughly enjoyable and well-executed. Bill Bryson’s book completely changed what I thought was possible with a memoir. It’s engaging, it’s entertaining, and it makes you laugh out loud. After reading it, I completely revamped by own book and was inspired to aim higher with what I wanted to write. To celebrate my new book, The United States of Laughter, I decided to do a literal book launch. We attached my book to a pumpkin and then shot it out of a catapult. Shout out to Team ETHOS for helping me with the launch! Buy the book on Amazon in Print, Kindle, or Audiobook! If a tree falls in the forest, and no one is around to take a selfie with it, does it really matter? In today’s society, the answer seems to be no. So I decided to take a selfie in each of the 50 states and compile them together in this video. If you want to check out the individual pictures, you can see them here on Flickr.